Rania Hassan combines knitting and painting to weave sculptural stories about our connections to time, place, and circumstance. 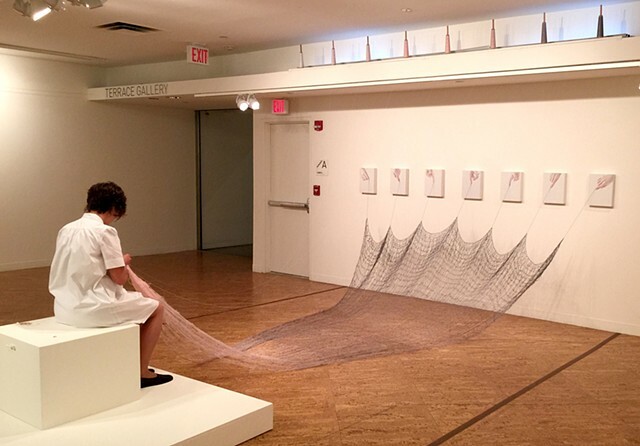 Time•Line explores how the threads of our beginnings and endings shape and define us. What brought you here to this point? Does one thread end where the next thread begins? In the Greek mythology of the three Fates, one goddess spins the thread, the second determines how long it will be, and the third cuts the thread. One spindle, seven hands, eight spools of thread—all gathering at a single point representing where you are right now. The spools of threads represent potential, the hand-knit threads represent what’s been done, and everything points to one end, which is the present. This exact moment will never happen again. Everything is right here.